← Cosplay Pictures for Saturday!! 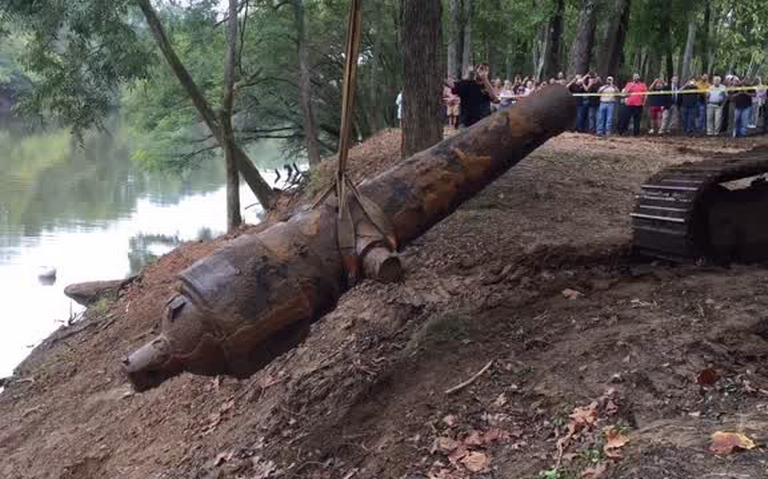 William Lockridge is part of a team that raised three Civil War cannons from the Great Pee Dee River. “I had three children, and it’s kind of like having a child I guess, they show up and you’re happy and sooner or later when the crowd thins out I’ll go over and they’ll dry my babies out and I’m gonna kiss them,” he said. The archaeologist was part of a team from the University of South Carolina. Each of the cannons weighs between 10,000 and 15,000 pounds. Two of them are Confederate Brooke Rifle cannons that are 11.8 and 12.25 feet each. The third is a captured Union Dahlgren cannon that is 8.9 feet long. The cannons were artillery on the CSS Pee Dee. The gunboat was tasked with protecting the coast at the Mars Bluff Navy Yard. When it seemed the ship would be captured by the enemy, commanders ordered the cannons dumped into the river, and the ship set alight. “Over the years ever since the guns were thrown overboard, people have always wondered about what happened to these guns, and so a number of individuals in the past, as well as present, were sort of looking for these guns,” underwater archaeologist James Spirek said. It took twenty years for researchers to locate the first two cannons in 2009. The third one was located in 2012. World War II veteran Catesby Jones was in the crowd watching the cannons get pulled out of the river. His great-grandfather made the Brooke Rifle Cannons in Selma, Alabama in 1863, WPDE reported. “I’ve been all over the country seeing these other tubes that were made in Selma, now that I’ve seen these two I’ve seen all of them,” Jones said. “To the history of the shipyard, the history of the Confederacy, the Confederate navy, it’s a huge addition, and it can’t be measured. I don’t know that I have the words to properly express it,” Lockridge said. Next up for the cannons is two years of soaking in preservation tubs at the Warren Lasch Conservation Center in North Charleston. Eventually, they will be displayed outside of the new Veterans Administration building in Florence County.